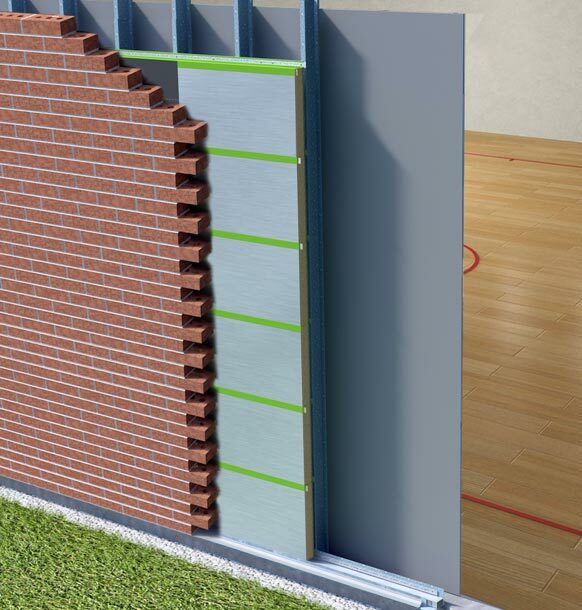 The most versatile of all the SMARTci Systems, the 2.5 in 1 System is revolutionary in the way it eliminates the problem of thermal bridging and provides a complete WRB. The SMARTci System boasts the highest thermal-efficiency ratings in the industry, and its simple, all in one approach solves almost every major continuous insulation problem. This 2.5 in 1 System is installed over open or closed frame installation and is coupled with a self-adhered, water resistive, vapor permeable, air barrier sheet membrane (by others) installed over the SMARTci 2.5 in 1 System. GREENGirt: Our award-winning steel and fiberglass-reinforced polymer (sFRP) girt. The Weather Resistive Barrier (by others) is a self-adhered, water resistive, vapor permeable, air barrier sheet membrane installed over the SMARTci 2.5-1 system. The application of this WRB membrane over the simple and easy to install SMARTci System, eliminates caulk, tape and expandable sealant, thus reducing material and labor costs, plus you get the warranty from the manufacturer of the WRB you choose. The splines of our GREENGirt sFRP connect to our pre-profiled rigid insulation panels, and act as sub-furring to house the CI and provide cladding attachment support – ensuring zero thermal bridging. Once installed, it becomes the ideal base for our efficient system of accessories. The finished product is a high-performance CI building envelope with the highest thermal efficiency ratings available. Add a self-adhered, water resistive, vapor permeable, air barrier sheet membrane (by others) over the face of the SMARTci 2.5 in 1 System, you have the most effective WRB / continuous insulation program in the market. Provides air/vapor/weather-resistive barrier by utilizing a self-adhered WRB sheet membrane over the face of the SMARTci 2.5-1 System.